Lumex aluminium opening louvre roof is the ultimate in louvred opening roof systems. Lumex is engineered to the highest quality, all aluminium construction with rust free advantages. With the Lumex aluminium opening louvre roof you can have complete control the sun and rain at your fingertips. Increase the comfort and practicality of BBQ area, pergola area, alfresco area or or keeping your cafe customers covered by controlling the amount of shade, light and breeze or keeping out light to medium rain. Each aluminium louvre roof comes with mortorsied opening and closing system and provides infinite placement options. 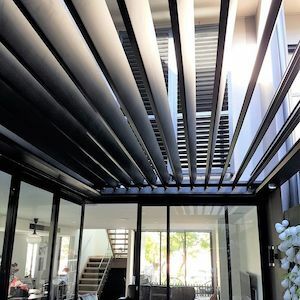 Our Louvered Roof Systems are designed for flexibility to suit your lifestyle and is as changeable as the weather. Flat straight lines giving you a modern look.